The theme of this past week has been pitching. In light of today being Friday the 13th, we wanted to put a twist on our theme and discuss common communication issues with investors amongst early-stage entrepreneurs. 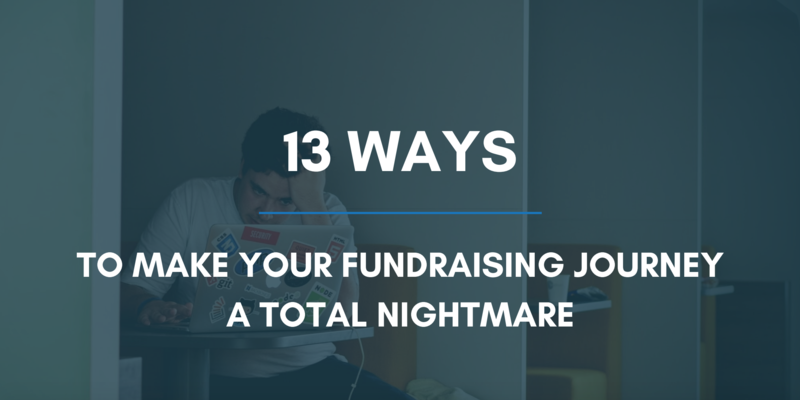 With that, here are 13 ways to make your fundraising journey a total nightmare. 1. Close your eyes and blindly apply to all the funders available! At the end of the day all you need is money, so who cares about the rest? Your time is everything, and, if that’s the way to save it, then do it! BFC Tip: Applying to the funders who are relevant to your sector, stage and track-record can save more of your time and make your fundraising journey much smoother. 2. Keep working on your idea until it’s perfectly perfect, even if it might take your entire life. After all, you don’t want anything less than great to be released. You will have peace of mind knowing that you won’t receive any negative feedback. Who cares how long it will take to release your product? BFC Tip: It’s often better to have a working product or service than postponing its release due to aiming for perfection. In practice, companies who have launched their working prototypes and polished them in the process perform better than their peers spending too many resources at pre-launch stage. 3. Don’t bother about testing out your product. You know exactly what the market wants, as you have global ‘expertise.’ You can’t imagine joining the 40%+ startups who close because the market doesn’t need their product. BFC Tip: Testing not only helps to evaluate the hidden issues, but it also helps you find out about your real market needs and gain a valuable feedback from your target audience. 4. Develop the mystery. Everyone from investors to your own mum should sign an NDA before getting to know your product. Your gains will be simple: no one will copy your idea, including VCs who aren’t busy enough and end up copying and replicating applicants’ ideas. BFC Tip: Investors don’t like NDAs. Simple as that! Why? Because they are already busy with assessing new applications, due-diligence, etc. Try to avoid building unnecessary barriers. 5. You shouldn’t waste your time thinking of Monetisation. This is just another complex term that should remain in the dictionary. You’ll be happy because people are happy with your product or service. Who cares about these little nuances like your house as a guarantee against your loan for a product development? BFC Tip: Monetisation strategy plays a big role in the assessment of your proposition. More and more investors tend to consider businesses at the post-revenue stage, which proves the market demand. However, being clear about how you are going to make money will also help to your business strategy. 6. Think big. Act big. Start your business as a proper businessman! Get a large office in the city centre, hire the most expensive staff, make sure to book as many adverts in top-tier media as you can, and be generous with consultants. No worries if investors or clients won’t be intelligent enough to buy into your big gestures. Your health can always benefit from exercising like running when debtors will knock on your door. BFC Tip: Before making any financial contributions, investors, even they are very keen to support your business, will always want to see how wise you are with spending your current resources and, of course, money. 7. Stay optimistic, and don’t waste too much time on unnecessary research. Investors love big numbers like one or five million. BFC Tip: Apparently, well-researched and grounded applications with specific and more modest numbers have higher chances to secure funding. Showing unsupported numbers that are too high or too low can equally put investors off, as they will doubt your financial wisdom and understanding of business. If you foresee that in three years you might need a total investment of five million but currently need 850K, show the breakdown and apply for a smaller sum. 8. Leave your modesty outside the door, especially when you deal with valuations. Your idea can already cost X amount. It doesn't matter that you invested just .0001 of the requested sum, you still should have 99%. You’ll be left with all shares of your business! BFC Tip: Here simply applies the common-sense rule. If you invested 3K and are looking for one million in the early days when your business has a very little traction offer of 10%, your business won’t look appealing to investors. 9. Never mind of explaining what you need funding for and whether anything has been invested. Better skip this part altogether in your pitch deck. It’s obvious that all businesses need some money. You’ll save yourself from spending time on unnecessary analysis. BFC Tip: Try to demonstrate in as many details as possible what you need money for. Ideally, also show what these investments will help you to achieve and by when. Investors want to help you to succeed, but they also want a return of their money of, ideally, 3 to 5 times of their original investment. BFC Tip: Not only will delegating the tasks in which you aren’t expert on contribute to a better business performance, but it will also enable you to work on the business rather than in the business. As for investors, their overall decision is inevitably linked to the strength of the teams and their expertise. 11. Stay calm regarding the competition, as it’s unlikely that someone else has the same idea or has even developed it. You can inspire investors with your original thinking. Even if there is a similar solution, why would investors spend their time on researching this? BFC Tip: Investors do cross-check the info you provide and always check for similar propositions on the market. Hence, after seeing someone’s failure to perform a proper research, they will conclude that either you do not know your competition or simply wanted to mislead investors. 12. Don’t pretend to be a graphic designer, and don’t waste your valuable savings on one! Who said that pitch decks or investment presentations should be clean, polished, catchy and visual? A Word document would make it. You can share much more information through words rather than pictures and can explain all about who you are and how the idea was born. Don’t worry if the file gets too long. Just decrease the font to the minimum possible font, as investors have a ‘strong eye’ on good ideas. BFC Tip: Your Pitchdeck should be a maximum of 13 to 15 slides. The more complex and harder to read it is, the fewer chances it has to succeed. On average, for the first review investors dedicate 1 to 3 minutes per application to skim through it and see if it is relevant. Try to make sure that your presentation can efficiently represent your proposal with a few colourful simple pages. 13. Finally, remember you are too busy for following up with investors. They should be ‘smart’ enough to run after you, as that’s their big chance. Leave these follow-ups for your personal life, such as when you text your dates straight after that it was great meeting them and let them know all the relevant updates. Investors don’t need this fluff. It’s a business! BFC Tip: It’s surprising how many entrepreneurs forever lose their chances with investors simply due to the failure to follow up. Even if your product or investment deck isn’t ready, but you had a chance to meet a relevant investor, you should do a quick follow-up with a polite note that you were pleased to meet them, remind again what you’re working on and give an expected timeframe of your next more detailed email. Keeping your investor in the loop will help to develop the relations needed to build their interest in you. To meet top funders, why don't you join us at the Business Funding Club? Or if you want to test your pitching skills and find out what investors think of your business, come along to our Speed-dating with Investors on April 17th.